MediaUpdate is the PUP that uses misleading techniques to prevent removal. Use Reimage to locate malicious components and get rid of them faster than with uninstall instructions. A full system scan blocks virus reappearance and prevents traffic to malicious domains. How can MediaUpdate hijack my computer? How to remove MediaUpdate virus? MediaUpdate (can also be called as MediaUpdate.com virus, MediaUpdate15.com pop-up virus, etc.) is a suspicious program that can lead you to the infiltration of adwares, browser hijackers and similar potentially unwanted programs. How can it do so? First of all, it hijacks each of web browsers (Mozilla Firefox, Internet Explorer, Google Chrome, etc.) that are installed on the system. Once it does that, it starts interrupting its victim during his/hers browsing on the Internet. 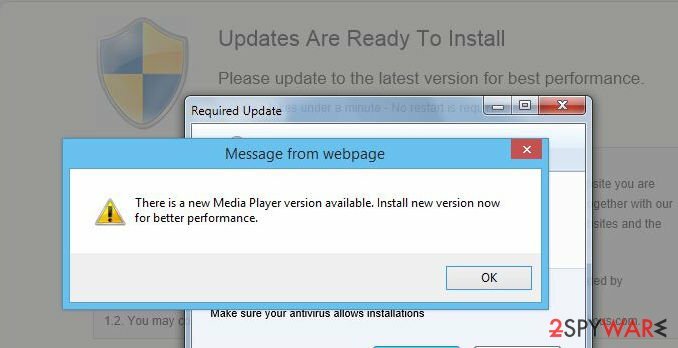 Typically this scareware displays tricky alerts that claim that user has to update some of outdated programs, such as Java, Flash Player, FLV Player, web browser, download manager and similar ones. These MediaUpdate15.com ads can look really tricky because they are usually filled with such details as various logos, links, etc. No matter how good these pop-up notifications look, you should ignore them because by clicking ‘Update now’ or similar button you can easily fall for downloading adwares, browser hijackers and similar programs that should be avoided. In order to get rid of Media Update ads, you should waste no time and scan your computer with the reputable anti-spyware. We recommend you that because each of these notifications is caused by an adware-type program. So, if you have been seeing them for a while, it’s one of the clearest signs showing that your computer has already been affected. How can you install adware on your computer? For more information about that you should check the next paragraph. For MediaUpdate removal, you should scan your computer with reliable anti-spyware, such as Reimage (compatible with Windows OS), Webroot SecureAnywhere AntiVirus (compatible with Windows and Mac OS X) or another reputable anti-spyware. Here, look for MediaUpdate or any other recently installed suspicious programs. Wait until you see Applications folder and look for MediaUpdate or any other suspicious programs on it. Now right click on every of such entries and select Move to Trash. When in the new window, check Delete personal settings and select Reset again to complete MediaUpdate removal. Once these steps are finished, MediaUpdate should be removed from your Microsoft Edge browser. Here, select MediaUpdate and other questionable plugins. Click Remove to delete these entries. Now you will see Reset Firefox to its default state message with Reset Firefox button. Click this button for several times and complete MediaUpdate removal. Here, select MediaUpdate and other malicious plugins and select trash icon to delete these entries. Click Reset to confirm this action and complete MediaUpdate removal. Here, select Extensions and look for MediaUpdate or other suspicious entries. Click on the Uninstall button to get rid each of them. Now you will see a detailed dialog window filled with reset options. All of those options are usually checked, but you can specify which of them you want to reset. Click the Reset button to complete MediaUpdate removal process. This entry was posted on 2015-06-16 at 06:11 and is filed under Adware, Viruses. You can quickly scan the QR code with your mobile device and have MediaUpdate manual removal instructions right in your pocket. How did you remove MediaUpdate?